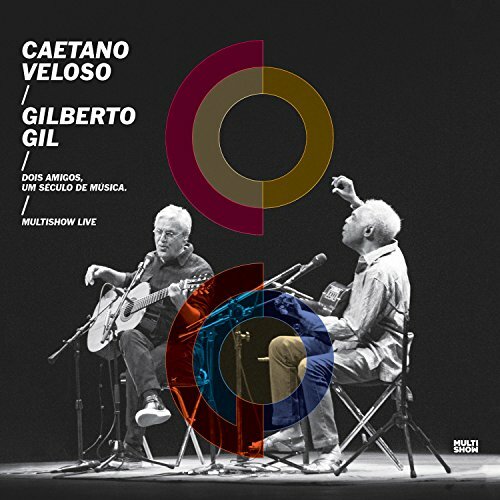 Nonesuch releases a live two-disc recording from the legendary, Grammy Award–winning Brazilian singers, songwriters, and guitarists Caetano Veloso and Gilberto Gil—Dois Amigos, Um Século de Música: Multishow Live—on April 8, 2016. This historic reunion celebrates a lifelong friendship over the half-century careers of two artists that have broken cultural, social, and political barriers through music. Dois Amigos, Um Século de Música: Multishow Live was recorded for television during a concert in Brazil last year, in the midst of the Dois Amigos tour. Gil and Veloso have, to date, performed for more than 135,000 fans at 44 sold-out concerts in 21 countries and 35 cities since beginning their tour last June in Amsterdam. Their tour begins again this April, with US stops in Los Angeles, Oakland, Miami, and Brooklyn. The new album features an entire concert, comprising 28 songs, including "Nine Out of Ten" in English; "Tres Palabras" and "Tonada de Luna Llena" in Spanish; "Come Prima" in Italian. Dois Amigos also includes longtime favorites from the artists, including "Coração Vagabundo," "Desde que o Samba é Samba," "Expresso 2222," "Esotérico," "Drão," and many others. The songs, which are mostly written by Veloso and Gil, are performed acoustically, as both duets and solo. Reviews of the concerts have noted the intimacy between Veloso's and Gil's voices and guitars, with Reuters calling their Montreux performance "pure and poignant," and the Guardian calling it "historic … a classy and emotional performance," saying, "They are now in their early 70s, and they are still remarkable." Their friendship begin in the early 1960s, in Salvador, Bahia, and has endured many triumphs and difficulties over the decades: from their first, historic concerts at the Teatro Vila Velha to performances in music festivals, moves to Rio de Janeiro and São Paulo, incarceration, and exile to London, among many other experiences. Dois Amigos was produced by Veloso and Gil, with sound engineering by their sons, Moreno Veloso and Bem Gil. The album was released internationally earlier this year. If you have any questions about this product by Multishow, contact us by completing and submitting the form below. If you are looking for a specif part number, please include it with your message.